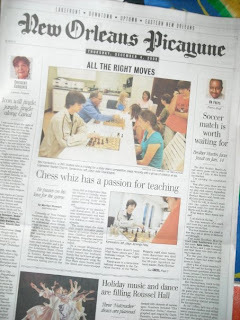 University of New Orleans freshman Alex Karaivanov is a long way from the Bulgarian professional chess circuit, where he was a rising star. But he's at home in New Orleans, doing what he loves best: teaching children to play the game. Sandwiched between a busy class schedule and a demanding training regime for the Louisiana State Chess Championship last weekend in Kenner, Karaivanov has been spending Wednesday afternoons taking part in the chess club at Edgewater Baptist Church in Gentilly, where youngsters 7 and older take turns pitting their skills against those of the chess wizard. "Teaching is my passion," said Karaivanov, 20, a business administration and management major who also tutors children in math and geography.